The Google Browser (Google Chrome) is a fantastic Web Browser. Except that it consumes a lot of memory (like many other browsers with features of these times), for the rest it’s all in favor of the Google Browser. The famous Browser also has aces up its sleeve. Did you know that there is a game with a T-Rex hidden in Google Chrome that you can only play when you are offline. 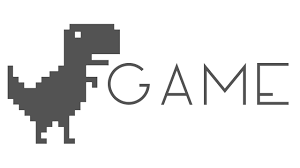 Note: you can play the Hidden T-Rex game online here. How can you play the T-Rex game? Practically there is only one way to play directly – you have to go in Offline mode (disable internet) and play all the time you want. The great thing is that it is also perfectly compatible with mobile devices. This also includes devices such as tablets. It is quite strange to play with the game of T-Rex on these devices, but who can never care when you have the opportunity to have unlimited fun when you are offline! In the same Google Chrome, you can check the entire project code, make changes and create one, if you wish, with some limitations. It was all launched using a BSD license. The restrictions are minimal, but you can check them here. Enjoy the game even when you are in Offline mode, the game of T-Rex could save your situation from total boredom without internet.